Very few bands have ever tasted the adversity that Savatage has. Nor have many stuck by their guns through the shifting tides of the music industry the way these Floridians have. They've endured line-up changes, label problems and, most crushing of all, the tragic loss of their guitarist Criss Oliva, a virtuoso whose talent ranked up there with Michael Schenker and Randy Rhodes. The band is going stronger than ever in 2002, but perhaps the most defining moment of their career came in 1989 with the release of "Gutter Ballet". That record saw Savatage at the peak of their form. The group always treaded a fine line between doom-laden heavy metal and atmospheric, melodic rock, bouncing from crushing Sabbath-like dirges to AOR inspired harmonies. Not exactly pop, they embraced the more melodic side of metal. Sometimes they veered to the heavy side (the excellent "Hall of the Mountain King") and sometimes to the poppy side (the horrible "Fight for the Rock"). On "Gutter Ballet", they found a harmonious blend of both. This is the archetypal Savatage album, featuring Criss at his searing best. His brother Jon also excelled here but be warned, his unique raspy, screamy vocals are very much an acquired taste. There's good back-up from the rest of the band and the production of Paul O'Neill gave the record almost a soundtrack-like feel - huge, rich and lush. Sounds of military helicopters kick off the record. A catchy bouncing bass line then picks up, and finally heavy guitars kick in to accentuate the riff. This is a powerful metal track that does not rely on speed. It features blistering soloing from Criss. The lyrics seem both pretty dated and yet right on target. The title track is pure Savatage, merging strong piano-oriented rock with a more metallic flavor. Not quite a ballad, it gives us a piano-flavored verse and a heavier guitar chorus. The tone of the song is moody and ornate. There are some good vocals from Jon as he relates lyrics like "Kill the Unicorn, Just to have its horn, Soon he's just a fantasy". This instrumental sounds like it was pulled right off a soundtrack. It's a huge, orchestral-sounding piece of work, gradually building to a thunderous climax. Criss' guitar work is exquisite. It's a fusion of classical bombast and rock dynamics. 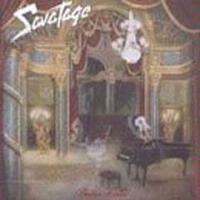 One of the best of Savatage's numerous "big ballads" finds Jon singing emotionally over a piano-based riff. It features an excellent memorable chorus. The lyrics relate the tale of a bitter master musician reflecting upon the past. Not really a metal track, this communicates strong feelings in a different way. Another instrumental, this one is based on acoustic guitar. The main melody is pretty but the song is too long and veers into boredom. With a song title like that, you'd be forgiven for thinking this was another melodic ballad track, but you'd be wrong. It's a fast-paced metallic number with almost pornographic lyrics. I wouldn't say it was the greatest song, but it's a welcome injection of energy after the previous couple of tunes. This is Savatage at their very best. The cut is a very gloomy and heavy tune with some great doomy riffing and a feeling of complete dread. It starts quietly but ominously and soon goes into a crushing doom metal riff. The song picks up speed and aggression in the last third, leading to some killer Criss Oliva guitar soloing before returning to that doomy hook again. It is an absolutely outstanding track! The record hits its stride with this fast-paced power metal scorcher. Despite the quickness of the tune, it has much of the same grim feeling as "Hounds". What an excellent track! This one starts with an almost cheerful melodic feel to it, and Jon's vocals are deceptively light. Then the crunching guitars cut in with a stalking feel, and those vocals get nasty in a hurry as they unleash lyrics about a homicidal lunatic who "beats his wife and douses the cat with gasoline". It is a very heavy and sinister sounding tune that, like "Hounds", picks up in aggression in the last third. Another power ballad that jumps from a wistful verse to a huge chorus, this is a more radio-friendly song and shows some of Savatage's AOR roots. They call this a "bonus track" but it was on every version of this CD I ever saw. This is more patented Savatage gloom, not fast at all, but very ominous and heavy. The lyrics are about life in a lunatic asylum. I love the "rolling" feel on the chorus riff. Jon's vocals are plenty creepy. It makes for a good conclusion to a fine album.